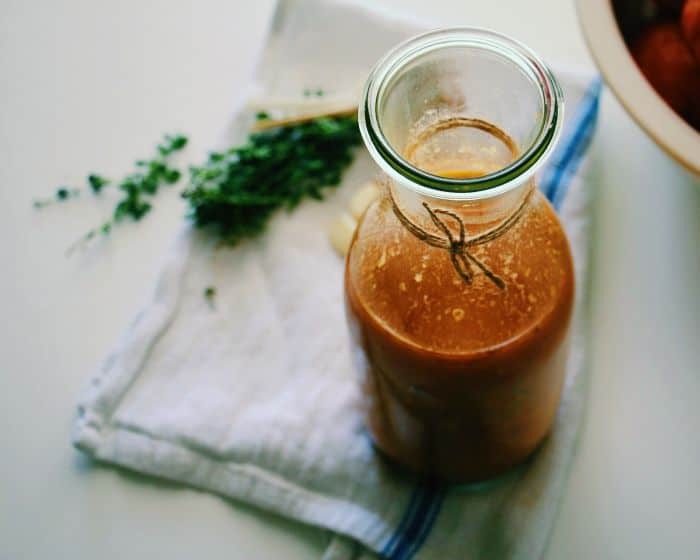 Set aside that jar of store-bought tomato sauce full of added sugar and switch it up with some Fresh Heirloom Tomato Sauce, using the best of what the season has to offer. Use it on top of some meatballs, in layers of lasagne, as a pizza sauce, or as a regular old pasta sauce. Such an amazing flavor and a great way to preserve the season. Get the kids to help and they will be lapping up those tomatoes in no time. This recipe has been updated from the original September 2015 version in order to provide a better experience for our readers. One of the things I love most about shopping at the local farmer’s markets is the great bargains that tend to pop up every week. Last week, my favorite market stand, which tends to be on the pricier side (but everything is so pretty and tasty I keep going back for more), was selling off huge flats of organic heirloom tomatoes for $6. We jumped on the chance to get one, and as we were paying, one of the ladies working there threw in about 10 extra tomatoes and just charged us $5, as they needed to be used up soon. Enter Big Batch Cooking: Heirloom Tomato Sauce Style. I made enough heirloom tomato sauce to last a few meals, and have a couple batches in the freezer for when pizza night strikes and fresh tomatoes aren’t around. I like to use these jars because not only can they be used for canning, but they are also pretty when placed on the table, which is nice when entertaining. Plus they are made in Germany. This is the most versatile pizza sauce in my repertoire – we use it on pizza, in lasagne, atop some meatballs, or on some cannelloni (check out this cannelloni recipe). It freezes well, which is a huge bonus and a great way to preserve the season. 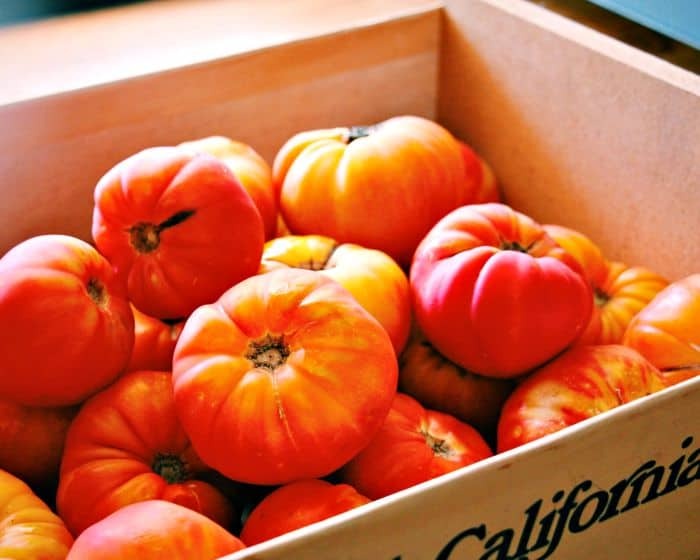 If you have a good farmers market where heirloom tomatoes are available then make sure you try them out. They have a much sweeter more complex flavor than a regular ol’ tomato. BUT if regular ol’ vine-ripened tomatoes are all you can get your hands on, then go with them. The sauce will still be amazing, I promise. Any Other Ideas For Using Heirloom Tomatoes? Zesty Heirloom Tomato and Nectarine Salad. If you try out my heirloom tomato sauce I would love to hear all about it sobe sure to leave a comment below. Made and canned this sauce today!! I tripled the recipe. My hubby loves spaghetti with andoli sausage to spice it up a little. So we will be trying this later this week!!! I kept tasting it through the cooking process and it made my house smell delish! Oh yay, I am so glad you tried it. I literally just bought 30 pounds of tomatoes at the markets today to make some more up, as we just finished our batch from last season. It is so handy to have on hand in the cupboard!! Pinned this! I’m still searching for that perfect homemade sauce. Can’t wait to try this one out! I LOVe fresh tomato sauce! This sounds so good! This is similar to the sauce I make, but pinning to try yours too! We grow heirloom tomatoes in our garden, this year the yield wasn’t great, but I picked up a few more pounds at the farm market. 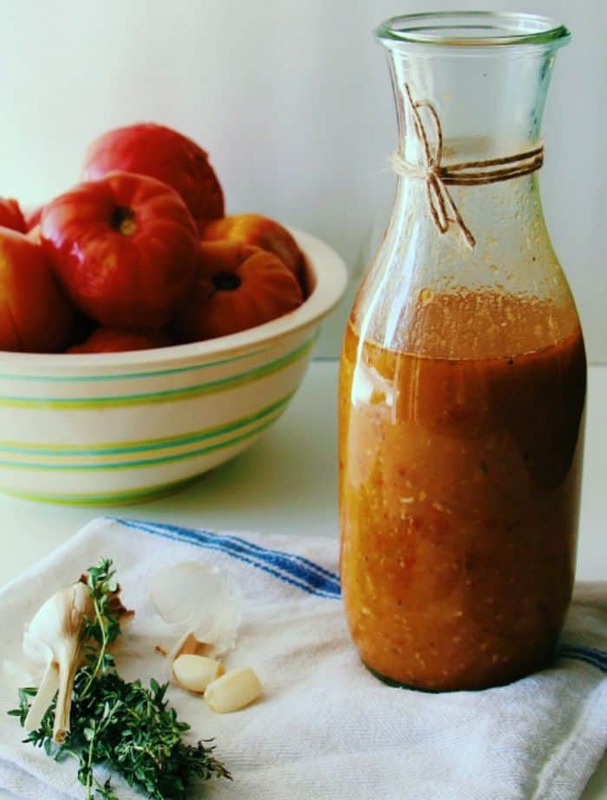 Love having sauce on hand and love heirloom tomatoes, they do make the best sauce! Thanks for the recipe. This sounds delicious and we’ve been trying to stay away from packaged items! We may have to dare to try to make our own! 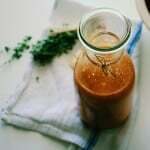 Not only a good recipe but s nice blog and post too. Wow this sounds fantastic. I love shopping at farmers markets and with little ones cooking in bulk is key to keeping my sanity! Thanks for sharing. Gotta love a bargain like that! It’s it lovely how simple ingredients prepared just as simply make for amazing meals? Totally Jenn, I used to be all about the fancy/exotic ingredients, but I am all for simple these days – they just taste so good! I bet this is really tasty. It looks great! I don’t cook as much as I should, but I love the idea of making a huge batch of this to be used later on. I love our local farmer’s market! I’ve always wanted to try to make tomato sauce! This recipe looks easy and delish! Oh it is definitely easy Kate!! I’m headed out the door soon to pick up some heirloom tomatoes to make up a caprese salad for a party tonight! Love farmer’s Markets! Oh yum. This looks and sounds just delicious. I would love to try my hand at making this. Delicious. Ooh you are lucky to have someone cooking it for you 🙂 I can’t go back to the store-bought stuff anymore! This looks and sounds so amazing! I bet my husband would love it! Thanks for popping over Waagmi 🙂 I hope you love it, if you give it a try! Sounds and looks absolutely delicious – and so quick to make! I think I’ll whip up a batch. Do it Emily 🙂 So easy! Fresh tomato sauce makes everything you use it in so much better! This recipe looks great! Doesn’t it Chris!! I really can’t go back to the store-bought stuff anymore, there is nowhere near the depth of flavour you get from the homemade version. We use it in everything! This sounds delicious! My mom makes her own tomato sauce in GIANT batches and it lasts quite awhile! Yum! I’m growing some pink beefsteaks right now, do you think they’d work well with this sauce? Definitely! I have used a couple different varieties, and every one has ended up delicious. The heirlooms just make it a very sweet version. Yum! I love tomatoes and actually have several waiting to be processed! I usually just make tomato sauce (plain, like you buy in a can at the store) to use in soup, but I like this recipe! Definitely making it today! Thanks! Fantastic! I hope you enjoy 🙂 Tomatoes are so awesome at the moment! I bet this tastes so amazing! 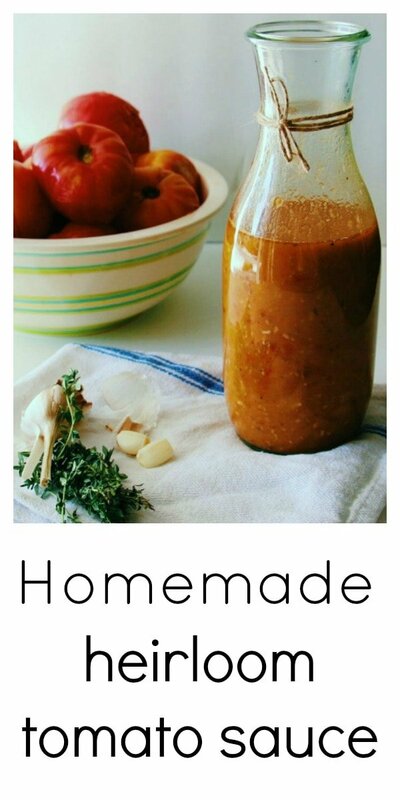 I love having fresh, homemade sauce in the house for quick dinners, I’m going to have to try this! It does indeed 🙂 I am the same, I find it makes those nights when you can’t be bothered so much easier when you have something to throw on some pasta! Omg this is fab!! I LOVE heirloom tomatoes (when I can get a good deal on them, of course). Thanks for the recipe!